Volunteering is a great way for children of all ages to learn important life skills while giving back to their local community. The benefits of volunteering are endless! Compass Charter Schools (CCS) encourages scholars to volunteer as often as possible. In facts, the counseling services team at CCS recognizes scholars who frequently volunteer with a community service award called, the CCS Samaritan Award. To qualify for the award, scholars must submit a log of 50 or more community service hours! Volunteering can help children of all ages develop compassion and empathy for others. It can also help them gain confidence, leadership and organizational skills, and plan for their future. Of course, volunteering is always beneficial for the community, whether it’s for low-income families, the homeless, the environment and several other categories. Giving back to others can help make scholars feel positive and accomplished! Altruistic, or selfless, activities like volunteering are known to have a positive impact on our overall mood. Volunteering allows scholars to have a positive impact on the world around them. When children selflessly help others and their community they are often more likely to feel empowered and good about themselves! Volunteering often increases a person’s happiness and can help decrease feeling stressed. We believe it’s important for scholars to feel good about making a difference in the world! We encourage to help their scholars get out and volunteer as often as possible. Volunteering can introduce scholars to new people and new life experiences! These experiences can help them expand their skills in areas like teamwork, leadership, responsibility, time management, and communication! Today, employers and college admissions representatives are seeking experienced and multi-skilled scholars. Volunteering is a great way for scholars to highlight their experience and skills on a resume or a college application. Having volunteering experience can potentially increase their chances of landing a great job or being accepted into their dream college. Volunteering often helps hiring managers and admissions representatives gauge a scholars skill set. They like to see scholars who are well-rounded and involved in extracurricular activities! There are countless scholarships that award funding to scholars based on their volunteer experience. Scholarships are funds organized through charitable donations. Therefore, scholarship boards that are responsible for awarding the funds often focus on giving funds to scholars who have demonstrated charity through volunteering. 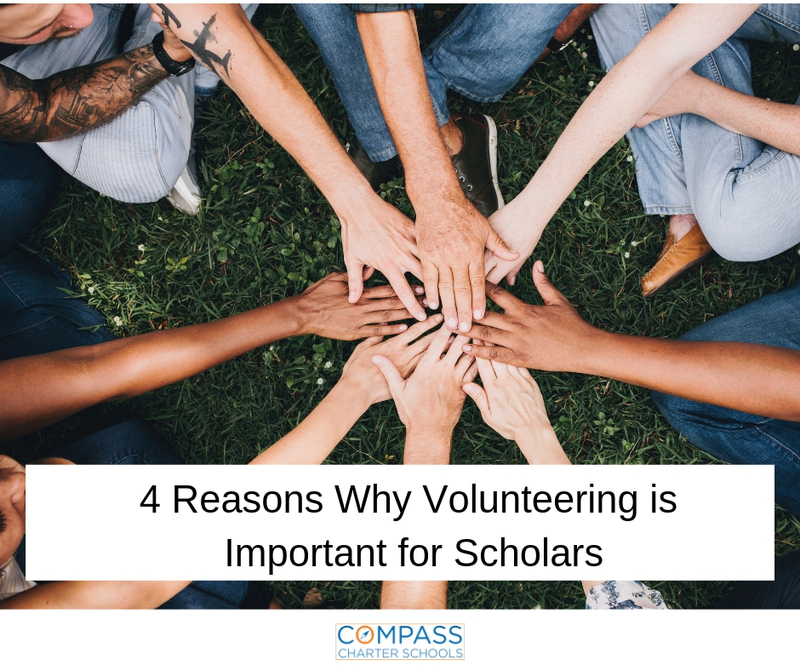 Having extensive volunteering experience can help increase the amount of scholarship funds that a scholar can apply to and receive. Compass Charter Schools (CCS) is a WASC-accredited virtual charter school that serves families throughout California. Interested in learning more about CCS’ flexible academic programs? Visit our website, or contact our enrollment team at enrollment@compasscharters.org or (877) 506-8631.